From a pack rat's treasure trove of motors, toys, and other bric-a-brac, Steve Gerberich builds some of the most entertaining contraptions you've ever seen. An alchemist of odds and ends, he's always searching for possibilities: a plastic dinosaur for this, a lampshade for that. He spins them all together in an elaborate call and response; call it a dialogue between mechanical memories and active imagination. A self-proclaimed lover of hand tools or any useful invention without a power cord, Gerberich turns discarded labor-saving devices into a wealth of fantastical sculptures. It's ironic that the tasks now assigned to these items are labor intensive and complex. Push a button or spin a crank and these marvels come alive: buzzing, whirring, squeaking, humming, clanking, chugging, flashing, and blinking. From the Kettle Head Choir to the Springs, Sprockets & Pulleys collection, this is analog work for the digital age. In the mid 1980s, with a University of Northern Iowa photography degree in his pocket, Gerberich moved to New York. The vivid images he'd been refining quickly morphed into window installations. Items that had previously been happy to live within his viewfinder now enjoyed more expanded environs, like SoHo storefronts. They now demanded motion, so Gerberich taught himself the skills needed to create a series of mechanical systems, which brought his art to life. A flock of geese might flap open- suitcase wings. A wooden cow sporting high-top sneakers might be endlessly milked by an ardent farmer. This new turn fed the artist's muse. Almost instantly Gerbo's world became a world of crazed kinetics. Some of sculptor's myriad influences are Cornell, Rauschenberg, Duchamp, Tinguely, Kienholz, and his late brother, Tim. He's also perpetually exhilarated by music. In typical elliptical thinking, this problem-solving inventor cites the title of Paul Klee's "Twittering Machine" as being more inspiring than the actual artwork. 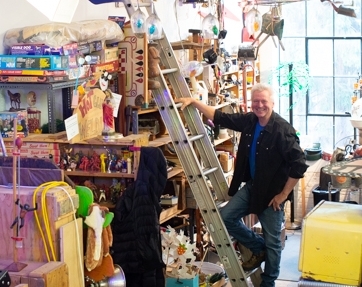 His famed Newburgh, New York studio - laboratory of thingamabobs whose compatibility is always being tested - holds a vast and odd collection of recycled resources. From moose heads to hand beaters he finds magical uses for all. And his processes aren't secret. He leaves an open invitation for friends to join him in his experiments. Come on in and get Gerbo-ized. There's always work in progress.